The D-block Sarbajanin Puja Samity, CR Park, which has “continued with tradition of constructing a completely eco-friendly pandal for the last 22 years” won this year’s Greater Kailash Assembly Durga Puja competition. It is a ‘mini Bengal’ during Durga Puja in C R Park with the distinct aroma of ‘dhuno’,(incense), the beat of ‘dhaaks’ (drum) and bhog (afternoon prasad). The Puja pandals dotting the locality are a tribute to the skills of artisans in terms of innovative pandal-making and lighting. The D-block Sarbajanin Puja Samity, CR Park, which has “continued with tradition of constructing a completely eco-friendly pandal for the last 22 years” won this year’s Greater Kailash Assembly Durga Puja competition organised by the Delhi government. Sujoy Ghosh, secretary of the puja committee, said this year’s theme was “rural India” and keeping in view the environment the pandal has been decorated with eco-friendly material. Debabrata Sarkar, a member, said only biodegradable material is being used in the effort to make Delhi a greener place. It’s not just the puja rituals, but also the bhog that’s a hit with nearly 30,000 devotees daily. 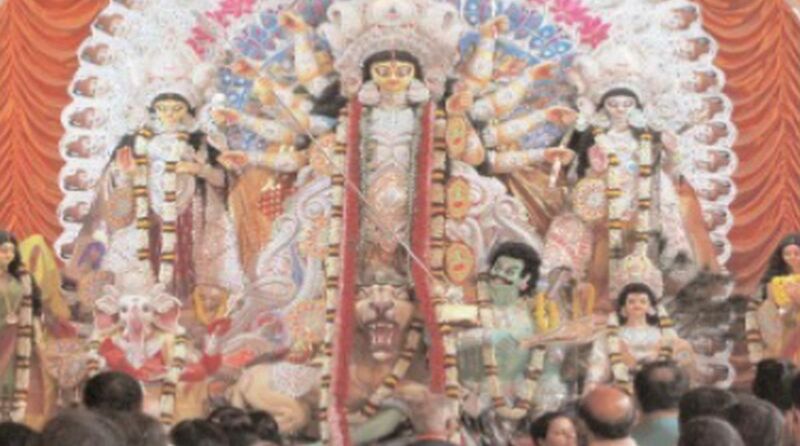 “We are organising various activities during the five-day celebration, including competitions for children and women’s musical performances by celebrity singers in the night,” said Bachchu Kumar Das, a vice-president of D block Durga Puja Samity.